The Baby Dolls grew to be a Mardi Gras fixture in the first half of the 20th century. 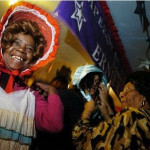 Over the years the Baby Doll tradition was lost, only to be revived by Antoinette K-Doe and Miriam Batiste Reed in 2004. 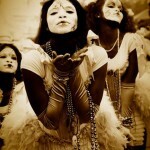 All on a Mardi Gras Day, the first in-depth documentary to portray New Orleans Black Mardi Gras, is the best oral history of the role of Skeletons and Baby Dolls in New Orleans Carnival. The Baby Doll costume includes bonnet, bloomers and lacy socks, and they’re said to have been pallbearers at Jazz Funerals. Nobody knows exactly what the origins of the Baby Doll tradition are, but it’s likely they originated during the Storyville era (1897-1917). Storyville was divided into two restricted districts, a white Storyville and a black Storyville. 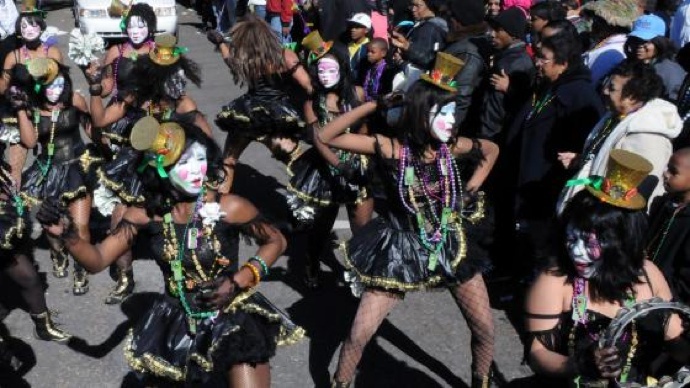 The black Storyville, Uptown, is supposedly where Baby Dolls began, and then spread across Canal Street, where girls decided to dress as Baby Dolls to show up the downtown Storyville girls. 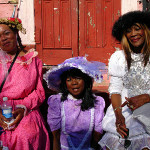 The Baby Dolls are once again a fixture in New Orleans culture. 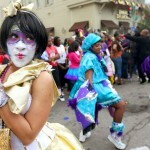 This video shows a Baby Doll dancing in Treme on Mardi Gras day.